All stats and records are provided courtesy of Missouri Valley Conference. Saying the the Purple Aces have had a rough first half of the season would be an understatement. And the fact that they are on a seven game losing streak does not help matters. Currently sitting in tenth place, the team needs to look at the details and stress more of the fundamentals as they try and dig themselves out of a hole. One of the lone bright spots for fourth-year coach Matt Ruffing has been the team’s free throw shooting percentage. The Purple Aces currently sit at third in the conference with a free throw percentage of 76.6. Senior guard Kerri Gasper leads the team with a mark of 87 percent from the charity stripe. The next 5 games may be key in determining Evansville’s seeding moving into the tournament in March. The Purple Aces have a tough three game homestand coming up with games against UNI, Drake, and Indiana State — the 3rd, 1st, and 7th place teams in the conference. They follow that up with a two game road trip at Illinois State and Bradley University. If the team can come out of that stretch with three wins, they could gain some confidence heading into the home stretch of the season. Expectations for the Crusaders were different coming into this season. With a 13-win campaign last winter, the team hired new head coach Mary Evans to build off the franchise’s highest win total since their 2008-2009 season. Unfortunately, the team has hit some bumps in the road as they sit at ninth in the standings. Evans has had some success in key areas though. The Crusaders current sit at 3rd in the MVC in 3-point field goal percentage at 33.8 percent on 8.2 3s made per game. Additionally, the team is second in the conference in steals with 9.5 per game and they have the third best turnover margin at +1.29. Redshirt sophomore guard Addison Stoller leads the team with 2 steals per game, good enough for fourth in the conference. Valparaiso still has time to right the ship in their next five games, as three of them involve teams in the middle of the standings, before they host a potential statement game with the first place Drake Bulldogs. Like Evansville, if the Crusaders can come out of this stretch with a 3-2 record, it would do wonders to boost their confidence heading into the final push before the tournament. Head Coach Cindy Stein’s sixth year at the helm for the Salukis hasn’t exactly been fruitful, but does have some hope left. The team sits at eighth in the standings with a .500 record. However, Southern Illinois is only 1.5 games back of fifth place Bradley and the team still has an experienced nucleus that can battle back from the early adversity. Unlike the other bottom-dwelling teams, the Salukis find themselves in the top half of multiple categories in the league this season. They have the third ranked scoring defense, only giving up 63.6 points per contest, and fourth in blocked shots with 3 rejections per game. Coach Stein has done a good job instilling the value of sharing the ball as well, as the team 15.4 assists per game second to only the conference leading Drake Bulldogs. Junior guard Brittney Patrick leads the conference in assists, dishing out 4.9 per game. Unfortunately, the team has a small margin of error in its next five games. After a pair of home games against the Valparaiso and Loyola, Southern Illinois takes on the top three teams in the conference (Drake, Missouri State, and UNI) in consecutive games, two of them on the road. If the Salukis can steal one of those two road games, and take care of business at home, they should be in good shape heading into late February. The Sycamores have had a respectable first half of the year. Former WNBA player Vicki Hall came on as the new head coach in March of 2018 to usher in a new chapter for the franchise. So far, so good for Hall, as the team sits at seventh in the conference with a 9-8 record overall and a 3-3 record in conference play. Hall’s team has displayed struggles offensively, scoring only 61.1 points per game. But they’ve made up for it with stellar offensive play. Indiana State smothers opposing offense, holding them to a respectable 62.4 points per game good for second in the conference. They also are first in steals, averaging 10.3 per game. Junior guard Ashli O’Neal leads the conference in takeaways with 2.7 per game. After a tough two game home stand against first place Drake and third place UNI, the Sycamores have some winnable contests against Evansville, Bradley, and Illinois state. If they can stay afloat during conference play, their positioning in the MVC tournament will be a lot more manageable. In Coach Kristen Gillespie’s first year as head coach of Illinois State, the team finished with a record of 14-16 — the most wins they had had in five years. Now in her second season, Coach Gillespie has the Redbirds on pace to eclipse that total and more, as they rank sixth in the conference. Illinois State brings the stingiest defense in the Valley to the table, locking opponents down and only allowing 59.2 points per game. They also limit opposing teams possessions by grabbing 27.2 defensive rebounds per game, fourth best in the conference. Senior forward Simone Goods (16.2ppg) and junior guard TeTe Maggett (15.6ppg) also put up points in bunches, placing fourth and fifth in the conference in scoring, respectively. The Redbirds’ schedule is quite favorable moving forward. After contests against fifth place Bradley and fourth place Loyola, Gillespie’s squad takes on a trio of teams in Evansville, Valparaiso and Indiana State that trail them in the standings. A record of 3-2 or even 4-1 is certainly attainable. After some good out of conference play to kick off the year, the Bradley Braves are shifting gears to make a mid-season push in the MVC standings. Third-year coach Andrea Gorski has already guided her team to match last season’s win total and Bradley is looking to make some noise in its stretch run. The Braves offense has come firing out of the gates, putting up 71.6 points per game, second only to Drake in the conference. They have also been capable on the other end, holding offenses to 63.9 points per game, good for fifth in the conference. The Braves are also first in offensive rebounding (14.7rpg), second in defensive rebounding (28.6rpg) and third in assists (14.7apg). Sophomore guard Gabi Haack is currently third in the conference in scoring (16.7ppg), and second in the conference in free throw percentage (87.2%). Bradley has an appetizing five game stretch coming up. With a pair of games against bottom dwellers Evansville and Valparaiso, and a trio of match-ups with Loyola, Illinois State, and Indiana State, Bradley could create some separation as it gears up for tournament play. 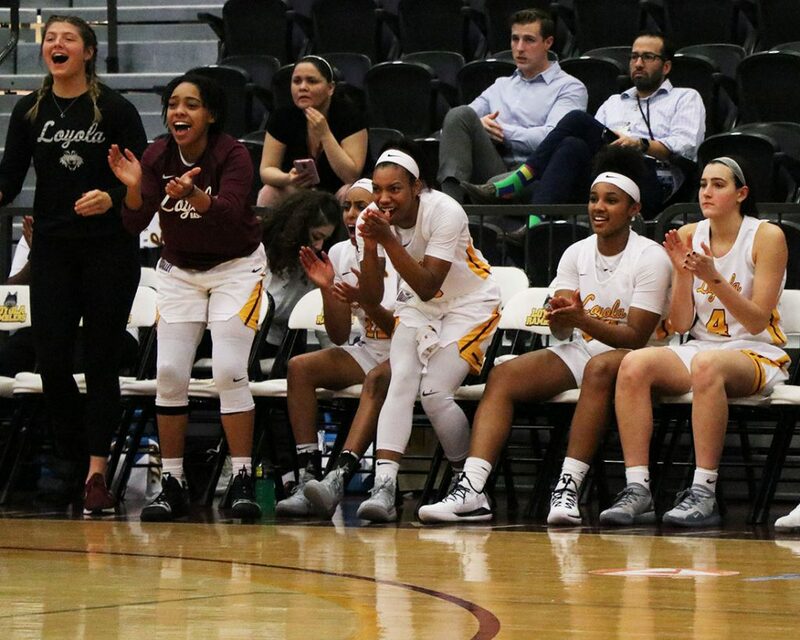 Under the direction of third-year coach Kate Achter, Loyola has made strides to rise to the upper half of the standings. Currently in fourth place, the Ramblers start to MVC play has been successful, and they are ready to prove that they are not a mirage. One thing Achter’s squad has maintained throughout the year has been efficiency. The Ramblers rank second in the conference in field goal percentage (43.5 percent) and second in the NCAA in free throw percentage (78.8 percent). Sophomore forward Abby O’Connor, who leads the conference in free throw percentage (95.6 percent) is also ranked second in the nation. Loyola’s next five games will be important as they look to prove that they are not pretenders. Three contests will be against top five teams in the conference (Missouri State, Bradley, UNI) and the other two contests (Southern Illinois, Illinois State) will be against teams still not too far behind the Ramblers. Coaching a young group composed of mostly freshmen and sophomores, look for Coach Kate Achter to have her squad prepared for the tests to come. Now in her twelfth-year as the Panthers Head Coach, Tanya Warren is no stranger to the big momentum swings of MVC play. Although the team had a great out of conference performance and a good start to conference play, don’t anticipate Warren’s group to let off the gas pedal. Where has Northern Iowa made its mark this season? The charity stripe and the 3-point line. Second in the conference in free throw percentage (78.2%) and third in 3-pointers made (7.3). Sophomore guard Karli Rucker paces the team in points (15ppg) and assists (4.1apg), and ranks fifth in free throw percentage (83.9%) in the conference behind teammate Mikaela Morgan (86.1%). The Panthers next five games will start out slow, but end with a bang. The first three games on the docket, bouts with Evansville, Indiana State, and Southern Illinois, should not be too difficult for UNI. However, the big games to look out for are the home contest on February 3 against second place Missouri State and a road trip to Loyola on February 8 to take on the fourth place Ramblers. The Panthers will look to come out of that stretch at least 4-1. In the five seasons that Coach Kellie Harper has steered the ship for Missouri State, the team has had 16 wins or better. With non-conference play officially over, riding an 8 game winning streak, the Lady Bears have made Drake University look over their shoulder at the top of the standings. Missouri State has mainly made their mark by steamrolling opponents. Ranked third in the conference in scoring (69.3ppg), the Lady bears rank towards the top of the conference in field goal percentage (41.3 percent) and offensive rebounds (13.8rpg). MSU senior guard Danielle Glitzen ranks twelfth in the conference in scoring (12.9ppg). Meanwhile, freshman forward Jasmine Franklin is fifth in the MVC in rebounds (7.3rpg). Looking ahead, the Lady Bears have a rough five game stretch ahead of them. A date at home with the Loyola Ramblers on January 25 could be competitive, but two away games with Drake and UNI may spell trouble for MSU. Harper will do her best to keep her team level during this blip in the schedule. The two-time defending MVC champion Drake Bulldogs have picked up from where they left off in 2018. An upset of 13th ranked South Carolina is the crown jewel of their resume. In addition, Coach Baranczyk’s team has dominated its conference schedule to this point, with four out of its five wins coming in double digit margins of victory. Drake’s dominance has certainly provided some legitimacy to the conference from the outside looking in. “They haven’t lost a league game since 2016. They’ve won 45 straight regular season Valley games.” said Ryan Davis, assistant commissioner of the Missouri Valley Conference. The Bulldogs lead the league in scoring (81.1ppg) and assists (22.0apg). Junior forward Sara Rhine (19.3ppg) and junior guard Becca Hittner (18.2ppg) lead the conference in scoring and Rhine also leads the conference in field goal percentage (58.4%). Of its next five games, only a match-up against Missouri State on February 1 looks like it could give the Bulldogs some feasible competition. But Drake hasn’t lost a conference game since 2016. With Indiana State, Evansville, Southern Illinois, and Valparaiso on the docket, look for DU to rack up the wins as they look to lock in that MVC first seed and a NCAA tournament bid.